When some people smile, they have dimples in one or both cheeks. Other people don't have dimples. This is occasionally said to be a simple genetic trait; the myth is that dimples are controlled by one gene with two alleles, and the allele for dimples is dominant. I do not know how the myth got started; I have searched the literature thoroughly, and I have not found any scientific papers with any genetic evidence on cheek dimples. Dimples vary in how obvious they are. Wiedemann (1990) suggests that their appearance may be affected by circulation, body weight or muscle tone, although he does not cite any evidence for this. He describes several individuals who had dimples as children and lost them by adulthood. This would make it impossible to divide people into two distinct types, having dimples vs. not having dimples. 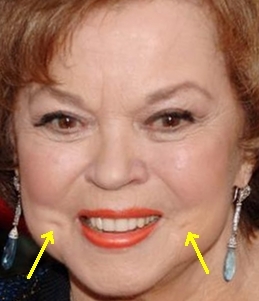 Winchester (1951) claimed that dimples are dominant to non-dimples, but with the complicating factor of variable expression. He did not cite any studies as evidence for this assertion, and I have not been able to find any. The presence of dimples may change during an individual's lifetime, and there is no published evidence for a genetic basis for dimples. Therefore you should not use dimples to demonstrate basic genetics. Wiedemann, H-R. 1990. Cheek dimples. American Journal of Medical Genetics 36: 376. Winchester, A. M. 1951. Genetics: A survey of the principles of heredity. Houghton Mifflin Company, Cambridge, MA. This page was last revised December 8, 2011. Its address is http://udel.edu/~mcdonald/mythdimples.html. It may be cited as p. 22 in: McDonald, J.H. 2011. Myths of Human Genetics. Sparky House Publishing, Baltimore, Maryland.